Game of Thrones video slot will take players on an incredible journey to Westeros, where a host of noble houses fight for the coveted Iron Throne of Seven Kingdoms. Pick one of Baratheon, Lannister, Stark or Targaryen houses to join and you will be in for some great prizes should your party emerge victorious in the final count. The five reel 243 payline game (15-line slot also available) is the latest branded slot from Microgaming, created under the exclusive license from HBO. Themed on arguably the most popular TV series of late, the slot launched simultaneously on desktop and mobile, and it has been very well receives by the casino gamers. Allowing customers to choose between four impressive bonus rounds, while featuring Stacked Wilds, Scatter Wins and Gamble Trail Feature, Game of Thrones will keep you coming back for more. Some players will be disappointed to see no characters from the original TV series appearing in the video slot, but the iron throne, Game of Thrones logo and four badges representing Baratheon, Lannister, Stark and Targaryen houses populate the reels instead. Playing cards Ace, King, Queen and Jack complete the list of game icons, with high-value symbols becoming animated as they form winning combinations. The game features a 243 Way Wins scheme, meaning that matching symbols pay anywhere on adjacent reels rather than on conventional paylines. And while there may be just two coin sizes to choose from, by staking between 1 and 10 coins, gamers can further increase their total bet. 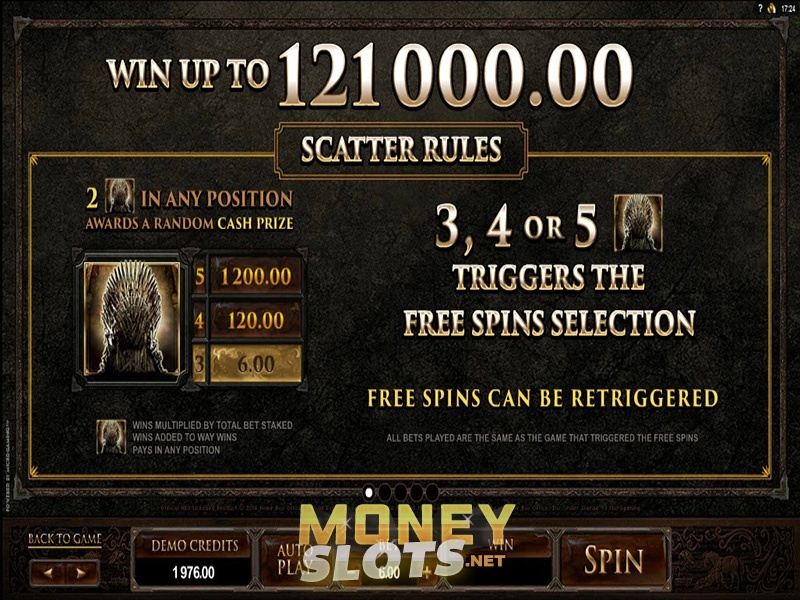 Game of Thrones Logo is Wild and it appears stacked in the main game and Free Spins. Wild substitutes for all symbols apart from the Iron Throne Scatters. Obtain two Scatters in any position and you will receive a random cash prize, while you will get 1x, 20x and 200x total bet for three, four and five of these. Get three or more Iron Throne symbols scattered anywhere and a Free Spins Selection will be triggered, where you get to choose between four bonus rounds with up to 18 free games and multipliers up to 5x. Use Gamble Trail Feature when your base line wins are less than impressive to try and double your payout. The option can be used up to four times in a row. 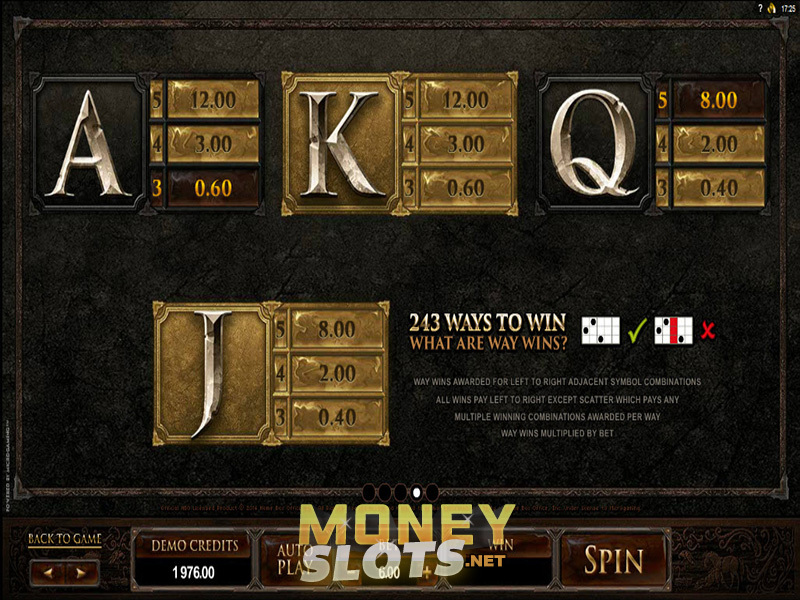 Microgaming clearly made the right decision to release the video slot on their HTML5 platform, allowing mobile gamers to enjoy the premium title on the move, with this particular mobile slot featuring improved layout that has a classy feel to it. The total bet value can be adjusted without even leaving the main screen, while players will also be impressed by the lightning fast feedback and eye-catching animations. And with all those special features loading quickly, you clearly cannot go wrong with playing Game of Thrones on tablet or smartphone.